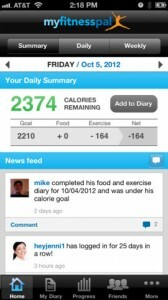 Calorie Counter & Diet Tracker by MyFitnessPal iPhone App Review. I must admit I really envy people who take pleasure in running, or working out, in general. Or those who can eat whatever they like, whenever they want to, and just don't get fat. They don't have to worry about keeping a diet, or lose their breath after running less than a mile. Oh, how I wish I could be one of them. But, for the rest of us, there's My Fitness Pal. Just the friend you need to help you get rid of all those extra pounds. I first came across My Fitness Pal over a year ago. 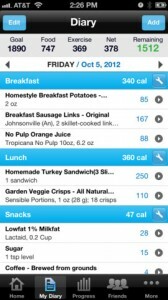 The idea of the app got me really excited, and since I was in need of a diet, I tried it. And it worked! That is until I lost my way again, started eating all sorts of junk food all day long, relying on the fact that I had already lost the extra pounds, so what harm can one bag of chips do? So, today, as I came across My Fitness Pal again and recovered my previous account, I was surprised to see that I am in exactly the same shape I was a year ago. Now, the reason I told you this story is to make you understand right from the start that My Fitness Pal is not a miracle worker. 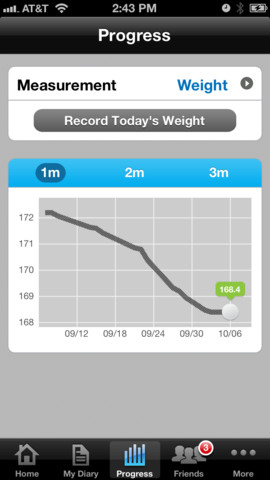 It's not one of those apps that promises instant weight loss just by staring at the app screen for half a day. My Fitness Pal is a realistic planner that helps you structure your daily eating and workout schedule. And helps you see exactly what you're doing wrong that prevents you from losing weight. Once you create your profile, including your current weight and your ideal one, the number of pounds you would like to lose per week, how active you are, how active you plan to be, and so on, My Fitness Pal will tell you just how many calories you need to eat daily to reach your ideal weight. That's it. No complicated diet, no food restrictions, no specific workouts suggested. 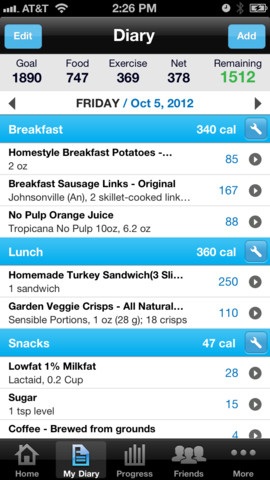 The only rule you need to follow is: keep your daily calorie count under the suggested number. And that's how it all starts. For every day, you have a Food column, and another for Exercises. Your job is to keep track of everything you eat, and every workout you do. Let's say you started your day with a cup of coffee, cream and sugar, plus a slice of white bread with ham and mustard. On your way to work, just access My Fitness Pal, and add everything you ate in the Breakfast section. 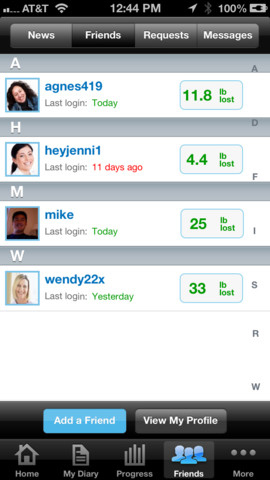 Or, better said, look up everything you ate by searching one food item at a time through My Fitness Pal's database. Every time you find the food item you are looking for, add it to the list. And the same stands for Lunch, Dinner, and Workouts. If you can't find a certain food item, add it to the database yourself, along with nutritional facts and the number of calories per portion. However, My Fitness Pal has such a huge database that you'll almost always find what you're looking for, unless it's something really rare, specific to a certain region. When you're done with this whole process of searching and adding food items, you won't only see how many calories you have left for the day, but also discover the amount of sodium, proteins, sugar, fat and carbs you consumed so far. The thing with My Fitness Pal is that it gets you pretty obsessed with counting calories. You'll find yourself reading all the nutritional facts on labels. Constantly thinking how many calories you have left for today. And always adding items to your Food and Exercise list. Sounds exhausting, I know. But that's just in the beginning. Once you start using My Fitness Pal for a couple of weeks or so, adding items to your Food list will become easier, since you already added most of them before. You'll start learning how many calories each product has, and stop reading labels like a maniac. You'll see what's good for you, what products are tasty, have few calories, and keep your stomach full for hours. You'll find out that any type of exercise, from walking your dog to housecleaning helps you burn calories. So, you'll probably go for longer walks, or clean the apartment more often, just to be able to eat that extra slice of pie without going over the suggested caloric number. Bottom line, losing weight is hard. There's no question about that. 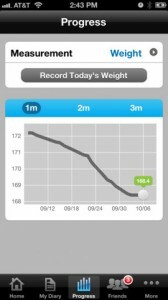 And, with the risk of repeating myself, My Fitness Pal is no miracle worker. But if you give it a try, and have the will to follow it and keep track of what you eat, drink, and how much you exercise on a daily basis, My Fitness Pal can be the friend you need, when it comes to losing weight. What do you think of Calorie Counter & Diet Tracker by MyFitnessPal? Scroll down for our comment section and let us know!